The AAP released its monthly Statshot report, and with one month left in the AAP's annual reporting cycle it's safe to say that 2014 was a good year for American trade publishers. The Association of American Publishers announced today that revenues for trade publishers were up 3.7% in the first 11 months of 2014. Paperbacks made a surprising resurgence, while ebooks showed solid growth and hardback revenues declined. The total revenue reported by the 1,209 trade publishers was $6.5 billion, up from $6.3 billion. The adult segment dropped by 1.4% to $4.3 billion, while the YA/kids segment continued to show strong growth. It was up 20.7% for the year, reaching $1.7 billion. 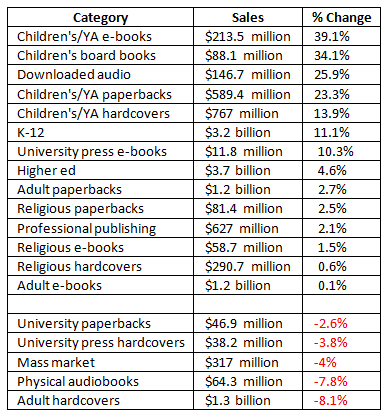 In terms of formats, revenues from hardback sales dropped by just under a percent, to $2.3 billion, while ebooks were up 4.5% (to $1.4 billion) and paperbacks were up 8.3%, to $1.9 billion. And for the first time I can also report that downloadable audiobooks were up 26%, to $147 million, while physical audiobooks droped 8%, to $65 million. 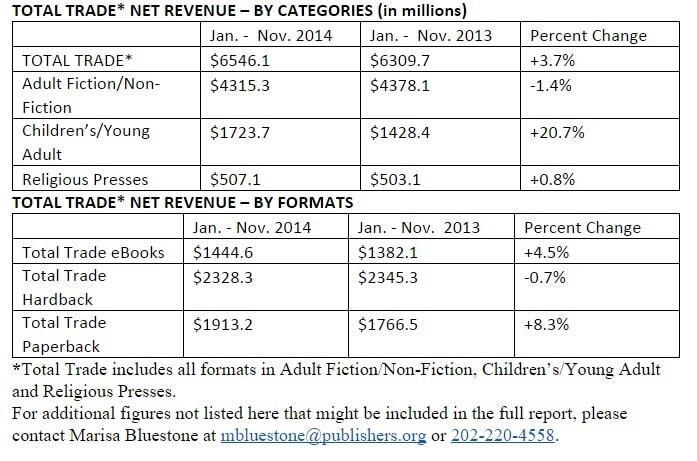 While we're on the topic of book revenue stats, earlier today Shelf Awareness posted this useful little chart. It shows all of the date which the AAP is tracking but not releasing to the press (it's for sale). I think it offers a useful perspective of just how large the trade industry is vs the rest of book publishing.